Note: Today’s review was written by K. Imani. Technical difficulties prevented her from uploading it today, so I took care of it for her. Review: After finishing the book a few nights ago, I’m still unsure as to what to think of it. There were parts of Friesner’s novel that I enjoyed and then there were parts where I just kept reading because I knew I had to write this review. One of the reasons why I think I’m blasé about the novel is because the novel I read before this one left a mark on my heart, had me mourning that the story was over. With Spirit’s Chosen, I put the book down and finished cooking dinner. No sadness, no missing of characters or Friesner’s world, just done with the book, ready for the next. As I thought about my ambivalence, I asked myself what caused this feeling? Was it the characters? Was it the world? Was it the style of prose Friesner use? What it the story? What? And then I realized, there were two main aspects of this novel that rubbed me the wrong way and the main one is the main character, Himiko. Now, I’m pleased that Friesner chose to write a character of color, specifically of Japanese descent, and set the novel in a historical time period. On the other hand, Himiko annoyed me a bit because she is a bit of a Mary-Sue. She is a like-able character and the reader wants to root for her to succeed, but she doesn’t have any faults. None what so ever. She always is able to maintain a positive attitude despite what is thrown at her and is always able to come up with the proper solution that succeeds every time. In fact, at one point when she experiences an obstacle and starts to finally have a breakdown, after she tells Daimu (her love interest) why she is upset, she ends up comforting him! I was completely taken out of the story at that point because it was so unrealistic. I realize that Friesner is trying to promote a strong female character, a warrior, but for a reader to connect, to really believe in the character, she must exhibit some faults or else the reader doesn’t truly trust the main character. I feel like Friesner got so caught up in her sweeping historical fiction with a strong female character that she forgot to give her character, and others, more depth. 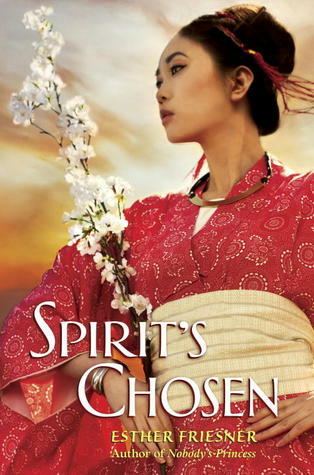 Spirit’s Chosen is a sequel to Friesner’s Spirit’s Princess but the way she structures the novel allows one to read this novel without having read the first. Friesner gives tidbits here and there of relevant information, as needed, from the first novel and it doesn’t overwhelm Spirit’s Chosen. Friesner definitely did her history, and visited Japan which she writes about in her afterward, and this level of attention and detail comes across beautifully. The world that Friesner creates is very real and believable, and is what makes the novel somewhat interesting. Recommendation: If you like epic historical fiction with balanced characters, I’d say skip this one, but if not and you just love historical fiction for the romance of another era, then this one is for you. It’s Asian Pacific American Heritage Month!